For the energy storage industry, the past five years have been something of a stage rehearsal for a market explosion to come, led by the U.S. and China, but expanding to cover markets across the globe. That’s the picture painted by Wood Mackenzie Power & Renewable’s latest report, Global Energy Storage Outlook 2019: 2018 Year in Review and Outlook to 2024. Tuesday’s report projects that energy storage deployments will grow thirteenfold over the next six years, from a 12 gigawatt-hour market in 2018 to a 158 gigawatt-hour market in 2024. That equates to $71 billion in investment into storage systems excluding pumped hydro, with $14 billion of that coming in 2024 alone. This growth will be concentrated in the United States and China, which will account for 54 percent of global deployments by 2024, followed by Japan, Australia and South Korea in a second tier of growth markets, and Germany, Canada, India and the U.K. rounding out the list. Each of these markets is taking its own approach to integrating energy storage into its grid operations and market structures, from the state-by-state development in the U.S. to China’s five-year plan. But they share a commitment to relatively aggressive renewables growth targets, along with the attendant challenges of integrating an increasing share of intermittent wind and solar power into the grid. Last year saw global energy storage deployments grow 147 percent year-over-year to reach 3.3 gigawatts, or 6 gigawatt-hours, the report states. That’s nearly double the average 74 percent compound annual growth rate for the industry from 2013 to 2018. In fact, last year’s deployments made up more than half of the total amount of storage deployed in the past five years, “indicating an inflection in storage demand,” Manghani said. This inflection point is measured not only in terms of project volume, but in the variety of regulatory and market structures allowing these projects to be financed and built, he noted. 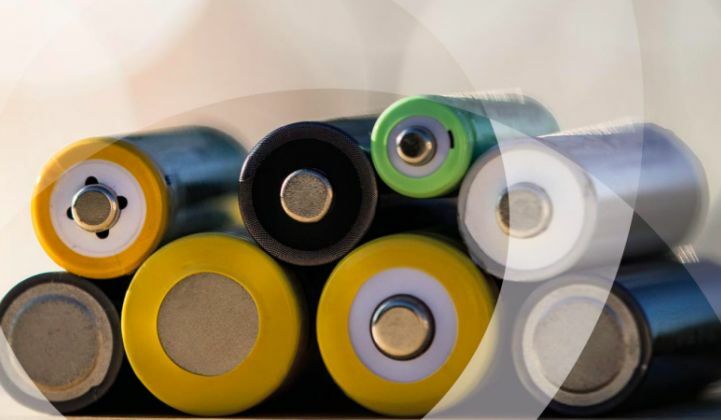 The past half-decade of energy storage growth has been driven by a relatively limited and isolated set of revenue streams, as well as government incentives designed to jump-start development in advance of the market structures to unlock the value of storage, he said. From 2019 to 2024, WoodMac projects a more mature but still early-stage compound annual growth rate of 38 percent for key storage markets, but with a far broader set of money-making opportunities for the systems being installed. This will include a shift from short-duration systems providing high-value, but limited-size markets such as frequency regulation, to long-duration systems that can start to displace diesel, oil and natural-gas peaker plants. We’ve already covered WoodMac’s growth projections for the U.S. energy storage market, the world’s biggest at present, and still expected to retain that position by 2024, if only just ahead of China. The U.S. deployed a record 311 megawatts and 777 megawatt-hours of energy storage in 2018, but that market is expected to double in 2019 and triple in 2020, according to last month’s Energy Storage Monitor from WoodMac and the Energy Storage Association. This growth will continue to be driven by key markets like California, the country’s leader in behind-the-meter batteries, and other states with gigawatt-scale energy storage deployment mandates such as New York and Massachusetts. But it will also be driven by utilities adopting storage for capacity or as part of large-scale solar projects, as with recent large-scale contracts in Hawaii, Texas, Minnesota and Colorado. And of course, Federal Energy Regulatory Commission Order 841, which orders the country’s regional wholesale market operators to open up energy, capacity and ancillary services markets to energy storage, will create new market opportunities. Turning to Asia, “we’ve seen China wake up in terms of energy storage, and slightly ahead of schedule,” Manghani said. China saw a 40 percent year-over-year energy storage market growth in 2018, driven by more than 300 megawatts, or nearly 500 megawatt-hours, of utility-scale deployment. In November 2017, China’s government announced a 10-year plan for developing its own grid-scale energy storage industry. This was partly a means of supporting and building upon its already massive dominance in battery manufacturing for electric vehicles, but it’s also a response to China’s mounting grid challenges — namely, integrating the massive amounts of wind and solar power being built in remote western regions to the country’s urban east. And when China decides to build grid batteries, it builds them at scale. “The majority of the deployments are currently pilot-scale projects — but when China does pilot-scale projects, we’re talking about tens of megawatt-hours,” Manghani said. Last year saw one 101-megawatt/202-megawatt-hour energy storage project come online in Jiangsu, and another 240-megawatt/720 megawatt-hour project approved in Gansu to reduce renewables curtailment. In the next five years, several more large-scale energy storage projects to support grid reliability and flexibility are expected to come online. About 65 percent of China’s 2018 installed capacity was developed by the State Grid Corporation of China for ancillary services purposes, indicating the importance of central planning for growth. South Korea represents a similar story of how government planning can drive massive energy storage market growth, with a new policy to allow storage-backed wind and solar projects to earn renewable energy certificates worth five times their capacity value driving a massive boom in 2018. From less than 10 megawatt-hours deployed in 2017, South Korea’s utility-scale and commercial-industrial behind-the-meter deployments boomed to 1,100 megawatt-hours in 2018, with nearly $400 million in energy storage investments and a pipeline of projects that’s already overshot its goal of 800 megawatt-hours by 2020. Australia, by contrast, has been driven by solar-plus-storage projects on the residential side of the market, due to its competitive energy markets and the increasingly attractive economics of self-generated solar power. Australia led the world in residential storage in 2018 with 150 megawatts, or 300 megawatt-hours, of systems deployed. Japan ranked a close second in residential storage, taking a slight lead over Germany in terms of 2018 deployments, although Germany still retains the lead in total number of systems deployed, at about 860 megawatt-hours. At the same time, policy shifts can have an impact on global energy storage markets. The U.K. installed its own record-setting 408 megawatts/325 megawatt-hours of utility-scale storage in 2018. But as these figures indicate, this boom was largely in the form of shorter-duration battery systems, which could see their value decrease significantly under changes to the U.K.’s capacity market mechanism to de-rate shorter-duration systems in favor of multi-hour storage. At the same time, a November European court ruling against the U.K.’s capacity market mechanism — along with the broader uncertainty over how the country’s departure from the EU under Brexit could affect its energy future — has created challenges for the market. Likewise, in Canada, last year’s efforts to incorporate energy storage into wholesale markets in Ontario and Alberta have been counterbalanced somewhat by the new Ontario government’s decision to cancel hundreds of renewable energy projects. The Wood Mackenzie Power & Renewables report is available for purchase here.